Hello you cheery cheeky bunnies! That adorable mascot is my child. Isn’t she adorable? We surprised her because she didn’t know we were even going to the parade, so it was a really super spectacular moment. It is hot today, so she works hard to stay hydrated, but she is going to be wiped out after a pep rally, a parade and then the Homecoming game. I am really proud of her. She went after the mascot place and she won it! Now she gets plenty of hugs from little kids, cheers from classmates, and is appreciated by the teams she cheers on, along with the rest of the terrific cheer staff. 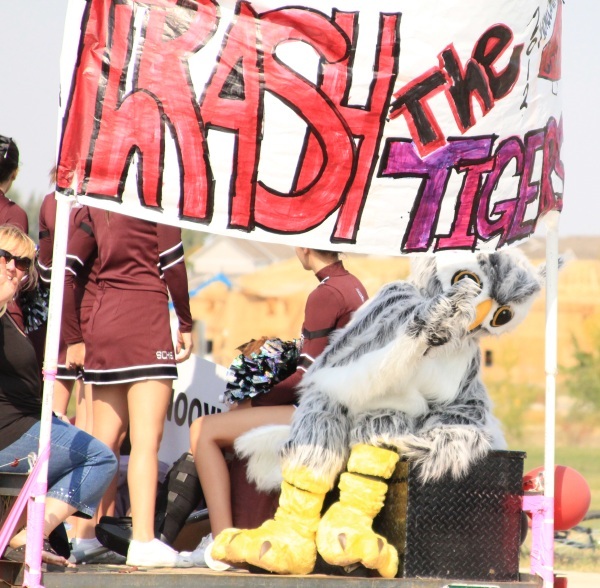 A secret: I was one of my high school mascots, too. But that’s just between us. Enough gushing proud mommy guts all over my junior. Exercise: Walked and worked for 2 hours at my treadmill desk at 1mph. Notes: I ate so many pizza toppings the night before, I’m just not hungry for breakfast. That happens. I should have been a little less exuberant about pizza toppings. The last day has been a practice in testing for dairy intolerance. What I learned after almost no cheese for days, and then quite a few ounces of it within a 24-hour period is that it upsets my stomach en masse and caused me to skip at least one meal due to its effects. I have had other bad side effects, such as bloating, gas, and other issues that are all tantamount to a lactose situation. That said, I may stick to an ounce or two here and there of dairy on any given day, but it will be exceedingly rare that I ever sit down to that much cheese in a sitting again. I’m thinking that I’d like to limit to maybe one ounce a day for a few days a week at most, but no more than that. And that’s ok. Weaning myself off of the dairy isn’t going to kill me; it’s just going to take a little time. If this is a journey of a lifetime, what’s a few quick stops along the way to check out something pretty wonderful? You DO have the most beautiful children…they grow like weeds! Enjoynevery moment with them! Well, my six year old magic bullet died…I purchased a new set…and wow! How the quality has changed, for the worse,…it would not chop ice! Back to the store it went…and I upgraded to a Ninja! The store just happened to have every Ninja model on sale…they flew off the shelves, I managed to get the last one! I hope this 1100 watt model grinds almonds…so I can grind my own! Does anyone have any great recipes to share? Breakfast…on the fly…leftover meatballs…always so yummy! Lunch is due….I want to indulge in my whey protein ice cream…low carb and an entire meal! Plus this will give me a chance to try my new Ninja! Dinner….I purchased a new variety of mozzarella…guaranteed to pull and string farther than any other! So dinner will have stringy Mozza melted on top of ground beef and olives! My Ninja grinds almonds and does everything. In fact, I love it so much, I never bought another blender again and sold my expensive food proecessor. If that’s not a personal testimony, I don’t know what is. All I can say is awwwww. What a girl! Momma is right to be proud! Oh and since this is just between us, what were you as a mascot? I didn’t have a full body costume. I was one of the Patriots of our High School.